When my husband suggested we go see Crazy Rich Asians, a movie he had heard profiled on NPR, I just about fell out of my chair. We don’t go to the movies together. I think the last one we saw in the theatre together was XMen 3, which came out in 2006. So off we went, and we really loved it. It was funny, and warm, and charming, and the leading lady Rachel, and the leading man Henry were both very dashing and fun together. So I decided to read the book. I had the advantage of hearing the actors in the movie in my head when reading, and it helped a lot. I did like the book, but the movie was better. 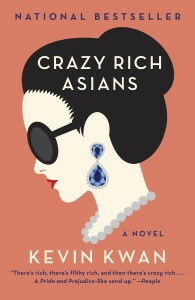 Crazy Rich Asians tells the story of Rachel and Henry, both professors in New York, coming to Henry’s home in Singapore for his best friend Colin’s wedding. Rachel is shocked to find that Henry’s family is one of the wealthiest in all of Singapore. Her friend from college, Peik Lin, and Henry’s cousin Oliver help Rachel navigate through the rich society and try to win over Henry’s family. The book takes more time with the characters since the movie had to condense some of the plot and wrap things up more neatly. It makes Peik Lin more clueless about who Henry’s family is, which I did not like. People who aspire to be in the social circles of the elite like Peik Lin’s family would know who the Youngs are. The other biggest change involves one of the characters who it would seem will play a bigger role in the second movie, Henry’s cousin Astrid. The book spends more time with her and her husband and their crumbling marriage. Astrid is a much stronger character in the movie, which I appreciated. Book Rachel is also much less supportive of her mother when the big reveal is dropped, although still for understandable reasons. I did not like book Rachel as much as movie Rachel. The book also ends without the sweeping romantic gesture of the movie, which is understandable since there are two more books. I will probably read the other two books at some point, but I am eagerly awaiting the next movie. It is a delight, and if you haven’t seen it you should. Filed Under: Comedy/Humor, Fiction, Romance Tagged With: bingo, cbr10bingo, representation matters, The Book was Better? My husband Jason and I are wonder twin cancer survivors! Sadly, all the radiation did not make us bionic...yet. Last year was a year of firsts for me: first time I successfully reached my cannonball goal, and the first time an author retweeted my review and gave me a shoutout! Happy bingo! I read the book before I saw the movie (as had my BFF who saw it with me). We were so happy to discover just how delightful and fun, not to mention romantic (which I really didn’t think the book was) the film was. SO much better than the book, which I don’t think happens all that often. Sadly, it doesn’t look like the movie is getting a cinema release here in Norway, so I’ll have to wait for the blu-ray release to see it again. Yes! Give me my big swoon-worthy romantic gesture! I actually disliked Peik Lin and her folks knowing about the Youngs in the movie. I get why they did it, but I liked the whole stealthy wealthy business aspect of the trilogy.